YES ..I’m excited to announce the news I will be visiting these cities (See List Below). This is the most sophisticated-innovative-progressive approach to hitting you’ll ever find. “Timed Hitting Perception” is the primary concept that is being taught. It is a 20 point system, melted down to ONE POINT, that helps your hitter to “hit better in the game”! that hinge upon their hitting model and their hitting tempo. from the “World’s Greatest Hitting Formula” that include the powerful principles of the “Pitcher’s Common Denominator”. 3rd Edition video #7 < then> 4th Edition videos #6 and #7 ..
*ONLY 4 Players per City! ♦ An online account giving you (lifetime) online access to the Best Hitting Drill EVER 3rd and 4th Editions ($345 value). ♦ 2 Hours of Face to Face innovative hitting training. ♦ Learn “Timing” Principles as they apply to your hitting model ($600 value). ♦ Free T-Shirt ( $20 value). Anaheim, Dallas, Chicago, Iowa City, Knoxville, Charlotte, Atlanta, Indianapolis, and Cincinnati. YES ..I’m excited to announce the news regarding YOUR “personal” ..one on one hitting camp with me ! It’s an opportunity to learn how to apply the most advanced hitting system to meet your specific hitting needs. I will work with your hitter (baseball or fast-pitch softball) over a 2 day period for 4 hours and 30 minutes of hitting instruction. *Morning Session – One on One directly for 1 hour and 15 minutes. *Evening Session – One on One directly for 1 hour. .. to program or “rub in” the system into their memory, making the information more usable for game like conditions. ♦ 4 hours 30 minutes of intense training. Learn “Timing” Principles as they apply to your hitting model ($600 value). 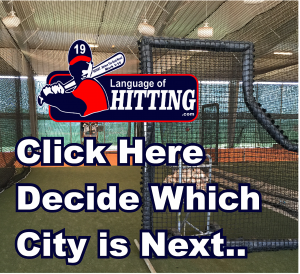 Language Of Hitting .. Is On TOUR ! I am taking the most comprehensive hitting system on the road. I am touring across the USA teaching a more advanced approach to hitting which centers around understanding the deep layers to TIMING. This includes learning that “the cornerstone” to all good timing, revolves around the pitcher’s common denominator (not his release point). I explain to the hitter’s (signing up) what this common denominator is, and how to TIME your vision, and how to TIME your adrenaline, and how to TIME your hitting model to the pitcher’s common denominator. These principles are directly taken from my big video series on timing called the .. World’s Greatest Hitting Formula. Also, I will be teaching the players how to utilize correctly the Best Hitting Drill – EVER! And how to create lift and launch without having think or try to “drive the ball” over the outfielder’s head. *I’m Planning the next city of our Teaching Tour.. Please <Click Here> and help me decide the cities we will visit next…OR ..Revisit! ‹ Pitching Video Series *Coming April 2019!